Tonight I’m going to write a letter to a friend who is leaving my school district. It’s her last week, and I have no hope for capturing all I’ve learned from her and all I want to thank her for in the letter. But I am unmistakably better because I have worked with her. Better as an educator. Better as a person. Better. I hope we all get to work with someone who is like that. A person who has made the transition from colleague to mentor to trusted friend. So, as I sit down to write my letter, I wonder why I always leave these messages unsent while folks are around. Certainly the end of a season together is a reasonable time to share something like this, but why do we wait for those moments? If you have a person like that, why not tell them today? Who deserves a letter from you? Who has left an indelible mark on not only your career, but also on you as a person? What’s stopping you from telling them now? 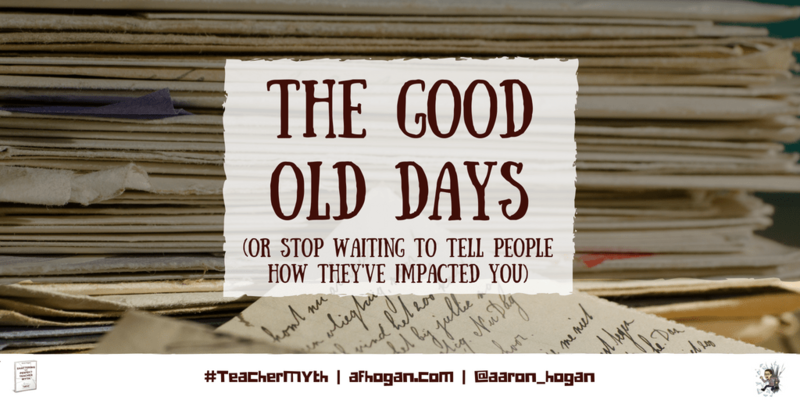 Why wait for another occasion to tell that person how he or she has impacted you?